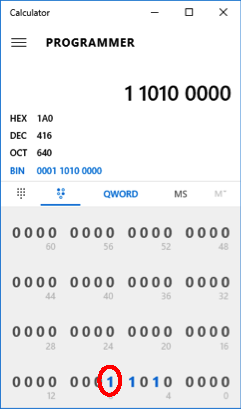 If you’re trying to calculate a bitmask and your binary is a little rusty, use the Windows Calculator to flip the correct bits. 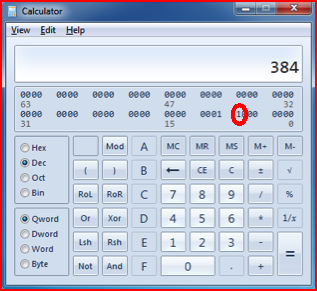 This entry was posted in Tip, Windows and tagged bit flip, calculator, windows on November 30, 2017 by Kenji Yoshino. I had an old hard drive I wanted to use as a secure, cross platform file transfer device, so I thought of TrueCrypt and UDF. Unfortunately, TrueCrypt for MacOS only supports formatting drives as Mac OS Extended and TrueCrypt for Windows only supports NTFS and FAT32. I ended up using TrueCrypt for Mac OS and the Mac’s command line formatting utility. From TrueCrypt, click the "Select File…" or "Select Device…" to select your newly encrypted volume and click "Mount"
Enter the password and any other authentication credentials required for the Volume. Check "Do not mount" before clicking "OK"
Back in the main TrueCrypt window, select the Volume and click "Volume Properties…"
Record the Virtual Device value. In this case "/dev/disk3"
This entry was posted in Encryption, Mac, Windows and tagged mac, truecrypt, udf, windows on July 10, 2014 by Kenji Yoshino. If you thought there were a lot of options in chrome://flags, there a ton options available as command line switches. See http://peter.sh/experiments/chromium-command-line-switches/ for a list of the available switches. If you’re using Google Chrome on Windows, it is pretty easy to launch Chrome with these command line options. This assume you are launching Chrome from your start menu, an icon pinned to your taskbar, or a shortcut you created somewhere else. Note: You must do this for each shortcut you use to launch Chrome. 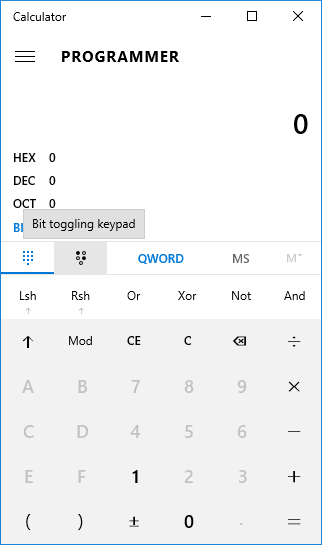 Right-click on your shortcut, in this case "Google Chrome"
In the "Target" field, move the cursor all the way to the right (past chrome.exe) and add the switches you want to use. This entry was posted in Web, Windows and tagged chrome, switches, windows on April 19, 2014 by Kenji Yoshino. Windows comes with a small list of trusted CAs installed but automatically imports CAs as necessary from the Microsoft Windows Update service (Windows 7 Home Premium SP1 64bit for a while, I figure I’d imported all of the CAs I really need I figured I could mitigate the risk of forged certificates (e.g. Iraq/Gmail, Diginotar) by ensuring I don’t import any additional CAs. Sure the CAs I already trust could be compromised, but this significantly reduces the attack surface. For Windows 7 Processional and Ultimate, Microsoft provides instructions for disabling Automatic Root Certificates Update using the Group Policy Editor; however, the Group Policy Editor cannot be installed on Windows 7 Starter and Home editions. If you have Windows 7 Starter or Home, or don’t want to deal with the Group Policy Editor, a simple registry update will turn Automatic Root Certificates Update off or on. Note: You must be an Administrator to make any of these changes, and if you have a Group Policy set for Automatic Root Certificates Update, it will overwrite your registry changes. Disable.reg (view) – this disables Automatic Root Certificates Update. Enable.reg (view) – this disables Automatic Root Certificates Update. Remove.reg (view) – this removes the registry entry effectively enabling Automatic Root Certificates Update. Note: You will most likely receive security warnings downloading and opening these files. If you want to be safe, open the files in a text editor and double check the contents. Start regedit by clicking the Start menu, entering “regedit” in the search field, and pressing <enter>. Set the Value data to 1, click OK, and close regedit. Deleting DisableRootAutoUpdate or setting it to 0, re-enables downloading new CAs from Microsoft. This entry was posted in Windows and tagged ca, update, windows on April 1, 2014 by Kenji Yoshino. I tested UDF and exFAT over a fairly wide range of non-computer devices, and none of the devices could read or write to it. If you need something that will work with non-computers, stick to FAT32. If you just need interoperability between computers (but don’t need to boot from the drive), switch over to UDF. I plan on testing UDF and exFAT with a few phones and will update this post when I do. This entry was posted in Linux, Mac, Windows and tagged exfat, fat32, mac, udf, windows on March 30, 2013 by Kenji Yoshino.